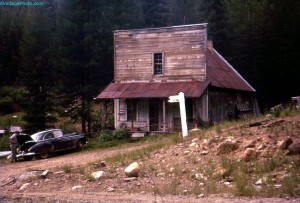 The Ghost Town of Bourne, Oregon is located in the Whitman National Forest in the north eastern corner of Oregon. Unlike a lot of ghost towns this one has a year round population, even though it’s much smaller then the population of the town in it’s heyday. Most of them are people who spend the summers here working the nearby gold mines, but there is a small year round population of people. Bourne is named after Jonathan Bourne Jr. from Portland. He was an Oregon state senator from 1907 to 1913, but it’s doubtful that he ever actually visited the town. The town sits along the Powder River, a famous historic gold mining spot full of abandoned gold mines, an awesome restored gold dredge and several ghost towns. This photo dates from 1955. This building is unfortunately gone now, or so heavily modified that it is no longer recognizable.